The Korean Peninsula, located in Northeast Asia, is bordered on the north by China and Vladivostock, Russia. To the southeast, it juts toward the lower islands of Japan. The Korean Peninsula is 222,154 km2, almost the same size as the U.K. or Romania. The administrative area of the Republic of Korea is 99,585 km2, slightly larger than Hungary or Portugal and a little smaller than Ireland. 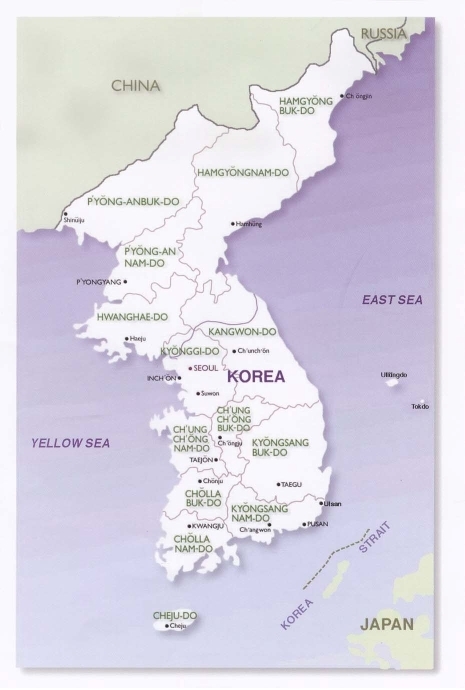 The Republic of Korea is composed of nine provinces and 6 metropolitan cities. Its capital city is Seoul. The landscape of the country is spectacular in its variations, about 70 percent of it being mountainous. More than 3,000 islands dot the coastline. A look back at the roughly 5,000 years of Korean history and archaeology reveals triumphs and tragedies, successes and struggles – all of which have been instrumental in shaping the Korea and Koreans of today. The Republic of Korea in the south and the Democratic People's Republic of Korea in the north are divided along the 38th parallel. In 1950, North Korea launched an all-out attack on the Republic of Korea, triggering the Korean War, which raged until 1953. This devastating conflict was halted by an armistice agreement that established the Demilitarized Zone (DMZ), which has divided the Peninsula ever since. Reunification remains the long-cherished but elusive goal of all Koreans on both sides of the vigilantly guarded Military Demarcation Line. The Republic of Korea exercises a democratic form of government based on a system of checks and balances. The Constitution was first adopted in 1948, when the Republic was established, and has since been revised nine times as the country has struggled to refine and strengthen its democracy. The most recent revision of the Constitution provided, among other things, for the direct election of the President for a single five-year term and for the institution of a system of local autonomy, which had been absent for 30 years. These two provisions are vital to the strengthening of democratic institutions in the Republic. The revision also reinstated the right of the National Assembly to conduct regular inspections of all state affairs, as a legislative check against the power of the executive branch. The Government consists of three branches: the legislature, in the form of a unicameral National Assembly; the judiciary, consisting of a system of district and appellate courts under the umbrella of the Supreme Court; and the executive, headed by the President, who is both Head of State and Commander-in-Chief of the Armed Forces. The President is assisted by the Prime Minister and the State Council. In the beginning of cadastral era, all cadastral surveys were done by the government. However, due to a number of problems of it, Korea Cadastral Survey Corporation (KCSC) has been exclusive organization for cadastral surveying in Korea. KCSC has branch offices in provinces, local agencies in cities, counties and districts. According to the applications of cadastral surveying by clients, KCSC deals with field surveying, examination of land information, changes of registered details. Table 1: Details of KCSC (Dec. 2002). The Korean cadastral surveying system was established according to the results of the land surveying and forest surveying project from 1910 to 1924. Through these projects, overall cadastral surveying and land review were performed and progressed to graphical cadastre by control point surveying and plane surveying. Digitization of cadastral maps started from 1990s and will be completed in 2003. The establishment of the "Parcel Based Land Information System" (PBLIS) is supposed to finish in 2003. The further task will be data transformation of each cadastral map into seamless maps in order to use them in National Geographic Information System (NGIS), and overlapping land information into cadastral information and improvement of accuracy. Cadastral research is mainly done by academic institutes and "Cadastral Technology Training & Research Institute" (CTTRI) in KCSC. The subjects, which are taught, are cadastral laws, cadastral computerization, cadastral information system, GPS technology, land administration, real estate, and career education. Governmental organization for cadastre is belongs to the cadastral departments in "Ministry of Government Administration & Home Affairs" (MOGAHA) and local governments. Main duties of the cadastral departments in the local governments are to provide cadastral services such as land registration and examination of cadastral records to the public. Cadastral surveys are done exclusively by KCSC. All cadastral surveys are carried out by KCSC. Therefore, it is not permitted for other surveyors including geodetic surveyors to do cadastral surveying. Regarding to national control points, both geodetic control points of "Ministry of Construction & Transport" (MOCT) and cadastral control points are used. Cadastral research in private sector is not so activated and mostly related to academic activities. KCSC has responsibility of all cadastral surveying activities in the supervision of the government, providing boundary and details surveying nationwide through local agencies of KCSC. The license of cadastral surveying is issued by the national human resource management organization and divided into three levels, namely low-level technician, engineer and expert engineer. The examination of license involves the practice and theory of cadastral surveying and cadastral law etc. To be a cadastral officer in governmental organization, he/she has to pass an special examination for service. All cadastral engineers have an additional training program by the yearly plan. The cadastral engineer must be a government officer or an employee of KCSC for cadastral surveying and needs a license. The Korea cadastral education system has 3 levels, those are high school, college and university, to bring up a skilled technical and engineering human resources who study the land management, cadastral administration system and cadastral surveying both theory and practices. Table 2: Cadastral Education Organization (Dec. 2002). 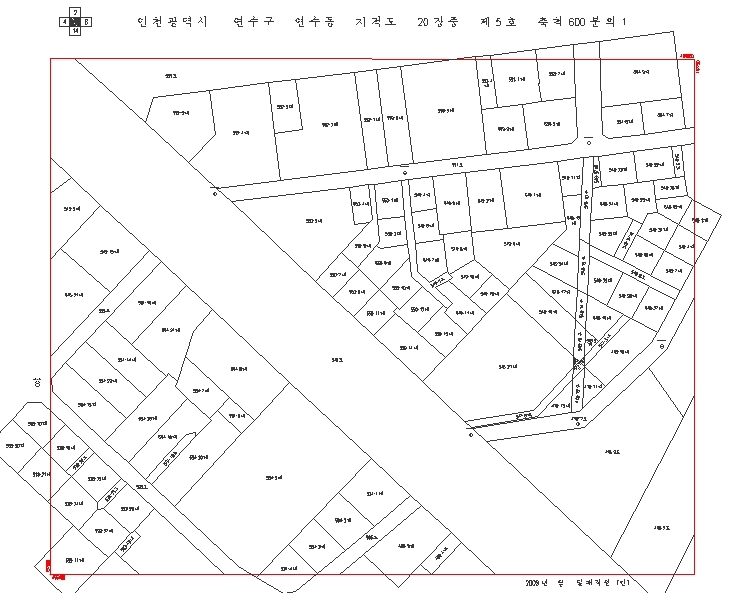 The Korea cadastral system started for the financial purpose and has been developed to the legal cadastral system in order to protect ownership. Recently, as the development of industry penetrates in all country and needs highly information on the facility of land, the national geographic information system and the cadastral information system working with an on line networking system have to be connected in order to provide multi-purpose cadastral service. By the history of Korean cadastral system, the cadastral affairs have been recognized as a national affaire. The administration manages boundary and land category and the Ministry of Justice is responsible for transfer and registration of ownership. Specially, the government rules the land registration also. The land of ownership is divided by 2 major use as public and private land and private land have boundary and land use category by government. The surveying activity is processed by the KCSC, which was nominated as an agency to fulfill cadastral surveying on behalf of the government. The cadastre is an administrative system, which notifies physical status of all parcels of national lands and legal rights on them, and manages changes of details of land. The Korean cadastre has three ideas, those are management of ownership, the registration system, and public open service of the cadastral information registering owner and relevant records. The Korea cadastral system is created by surveying on the parcel boundary and ownership nation-wide and registering it. All parcel shave a identity number, divided by a sheet system which have a unique map scale and managed by area. The Korean cadastral system has several cadastral records; cadastral book, cadastral map, forestry book, forestry cadastral map, boundary coordinates records and electronic files. In case of cadastral records, it has parcel number, ownership, land use category, address, area, sheet number, asserted valuation and topology of spatial presentation by national grid, which is divided by the sheet numbering system. The parcel is presented by a point, line and polygon number and its address. The cadastral record is surveyed by information as location, parcel number, land use, area, ownership, parcel ID, map details, land transactions and valuation. Table 3: Components of National Land (Dec. 2002). Cadastral map is composed of a land map and a forestry map system, which have various scale, but majority of cadastral map scale is 1/1200. The size of sheet is 50cm x 40cm and contains the information as address, parcel number, land use, index, title of sheet, grid coordinates, calculated distances of boundary, control points and so on. From year of 1999 to 2003, all cadastral paper maps are digitized and running with map and records in PBLIS (Parcel Based Land Information System). Cadastral map is re-structured by seamless mapping in one single graphic database with NGIS (National Geographic Information System), which is provide a public service by LBS (Location Based Services) system in parcel address system. 1. Building a homogeneous and seamless cadastral digital map. 2. Combination of topology and cadastral layers by geodetic frame network. 3. Making the topology data structure of the cadastral map data. 4. Changing of data format DXF to shape. For the cadastral reform, we reform on surveying method, modernization of surveying instrument, technical and legal aspect study and developed some area. Specially, all old cadastral maps are digitized and we could change the surveying method from plane surveying to digital TS and GPS surveying method. And all cadastral records and maps are run on the PBLIS system and we plan to study co-relate with networking system of cadastral and land registration system. The main issues of cadastral is reformation or re-surveying project, cadastral inconsistent area, which is different between map data and surveying data, surveying organization, national GIS, seamless cadastral map sheet problem, topology of database, surveying method and so on. Digitization of Cadastral Map: The project of the Digitization of Cadastral Map is to build a digital data base by electronic disk files and surveying data coming from TS (total station) in field. The cadastral information is opened for the public and linked to the other database as facility mapping data for the multi-purpose. The duration of the project is 5 years (1999-2003) and 0.75 million sheets of cadastral map data is input and running for the graphic purpose.